This is Sandy Dillon's tribute to the straw bale studio and it was the first shoot in the space. She's joined by Ray Majors and Sir Eddie Real. It was a way of testing out the space and the recording method. Guitar, Cahon and vocals were recorded together, then banjo, shakers and backing vocals were done separately. We don't have any traditional music studio recording equipment but envisage using cameras and edit software as the recording medium. We have used three techniques to record in the space. 2. Multi-tracking. Using the camera we record each instrument separately with each musician performing to a click track. 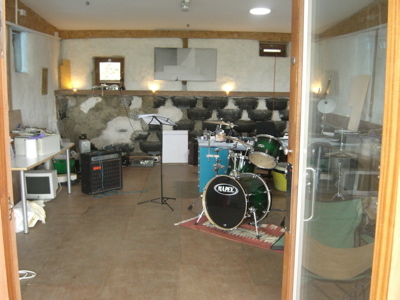 The straw bale walls mean that the building is very well sound insulated. We are located in a very quiet corner of Bristol, not under a flight path.